Talk about disruption! I was on Milfoil duty at the Narrows Boat Landing from 4-5 pm. Normally, that would be an easy shift but with Irene coming, boats were being taken out of the lake. And as you can see from the photo, the Kezar Lake Marina was very busy pulling boats out to safety. Camps and homes brought their lawn furniture, and anything else that could fly around, inside. Our daughter, Anna, is off to China for a one-year trip for language study. 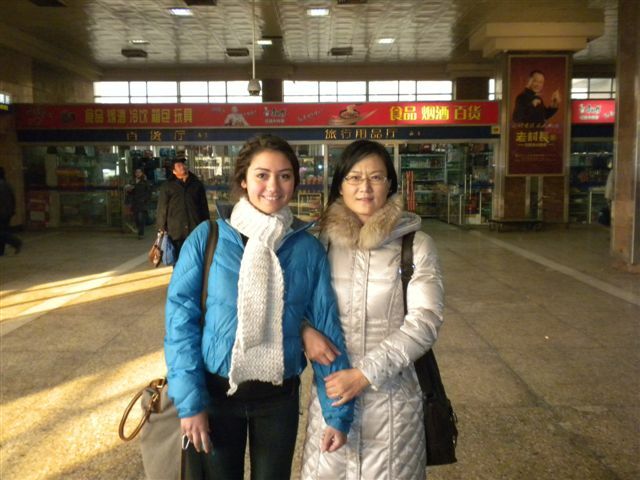 She is a participant in the NSLI-Y program and it is her second time traveling to China for study. Her original itinerary had her flying to Washington DC this afternoon. That flight has been cancelled for several days. The program has been trying to reschedule her (and another Maine program participant) on flights at different airports (Providence, Binghamton, Boston) without luck. We have been prepared to drive her to DC since she needs to be there for her Beijing departure on Tuesday afternoon from Dulles. We just received confirmation that she will be flying to DC tomorrow on a 10 am flight. That's the good news. The bad news is that it is from Bradley Airport, near Hartford. It will be a very early morning tomorrow and let's hope that Irene won't have washed out too many roads. When all is said and done with Irene and the sun shines again, will the Hurricane have lived up to its endless hype? Not sure but it is good that everyone prepared for it, including the Lovell Volunteer Fire Department. Good luck to everyone! Latest weather forecast for western Maine region. Photo of Hurricane Irene courtesy of NASA.